Mariana Myer, 13, of Rhode Island, is already very accomplished. 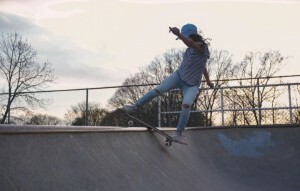 Her background is in surfing, skating and snowboarding, and she’s received a lot of exposure in RI as one of the best young skaters in the state. I got a chance to talk to Mariana about her career so far. She’s focused, but laid back, and answered my questions cheerfully and with purpose. Haley Nunes (Motif): I’ve been doing some research, and it seems like you’re pretty young. Mariana Myer: Yeah, I’m 13. HN: How did you get into skating and surfing? MM: When I was really young, I went to the beach with my family. My dad surfs, and I would watch surfers on the beach. So I started off surfing. Then I went to surf camp and got really into it. The next summer I [would watch] people skating, which made me really want to try that. I borrowed my friend’s brother’s skateboard one day and just really liked it. HN: What made you fall in love with it so easily? MM: It was just so different. It wasn’t an organized sport; it was independent and a “do what you wanna do” type of thing. It wasn’t structured; it was just easy and fun. HN: It came naturally to you? MM: Exactly. It wasn’t competitive either; it was fun to do it when you wanted to do it. HN: I’ve recently taken up skating, and it seems very much like a no-judgement sport. MM: Yeah, there’s no judgement; it’s just relaxing. HN: There’s a lot of pressure for girls in such a male-dominated sport. That definitely gets to me sometimes; do you ever feel that way? MM: Sometimes when there’s a lot of guys [at the park] and you’re the only girl, it does. But it’s also just to do what you love. You’re not there to show off; you’re there because you love it and you just want to ride. So if they’re gonna judge you, let them. You’re there to do what you love to do. HN: I’m very new at it, but even though I don’t know much it seems like guys at the park are happy that I’m trying to skate in general. MM: It’s probably cool for them to see another girl trying the sport. It’s different because it’s always guys, guys, guys, and they’re just surprised that a girl is doing it. It’s so rad. HN: Any advice for first time or beginner skaters as to what gear is best? MM: Yes. I started off with a carver, which has softer and bigger wheels. This lets you cruise around the park and get used to skating. Then you can move to a regular skateboard with harder and thinner wheels. HN: I was reading about you, and you seem pretty famous around RI. That’s a huge accomplishment. MM: Thank you. It’s just fun. People give you so many looks when you first start out, but you have to remember you’re just doing this because you love it. HN: What are some of your biggest accomplishments or proudest moments you’ve had since you started? MM: There’s an event in Jamestown called Skatefest. The first year I went I was 11. It was the 15 and under division, and it was all guys. I just decided to pop in and skate around. It was a competition, but in my heart I was just riding. 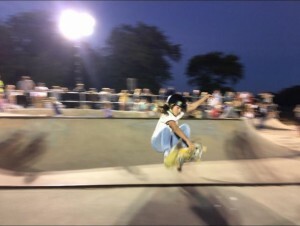 This was the first year of me actually skating, and I wound up getting third place. That was a huge accomplishment, especially against these 15-year-old dudes. I went back the next year and got first, and first again the year after that. But the first year I began skating and got third is probably my biggest accomplishment. There was also the OMF [Old Mountain Field Skatepark] fundraiser this year, and it was so rad to see more girls skating. HN: Do you have any goals for this year? Any tricks you want to learn or competitions you want to do? MM: I’m just kind of having fun with it for now, but a sick trick I would want to learn would be a front smith around the bowl corner at OMF in Wakefield. HN: Awesome. Is there anything else you want to add or something you want us to know? MM: If you’re a girl, don’t be worried or nervous about getting judged. Just go for it. 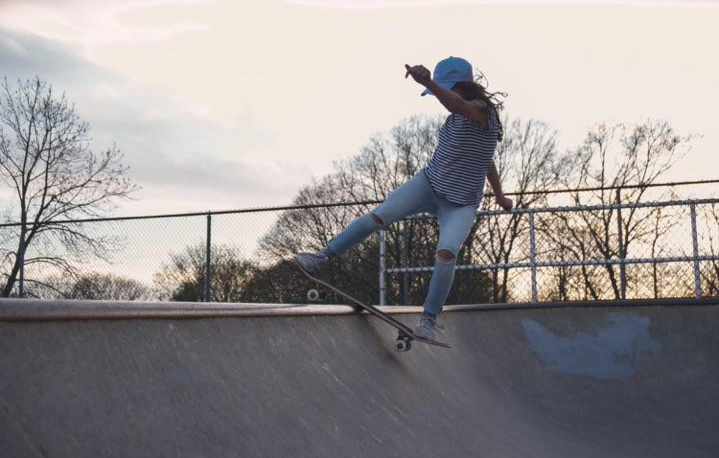 It’s so cool to see more and more girls get into [skating]. When I started, there were pretty much none. Remember that you’re starting out in it because it’s a cool sport.